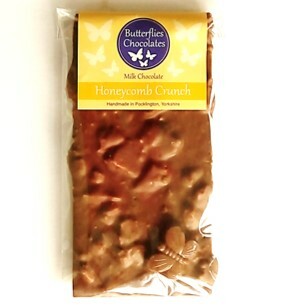 Get yourself going with some Honeycomb Crunch! Unlike most honeycomb, ours is made using real honey, harvested just down the road from our chocolate kitchen. 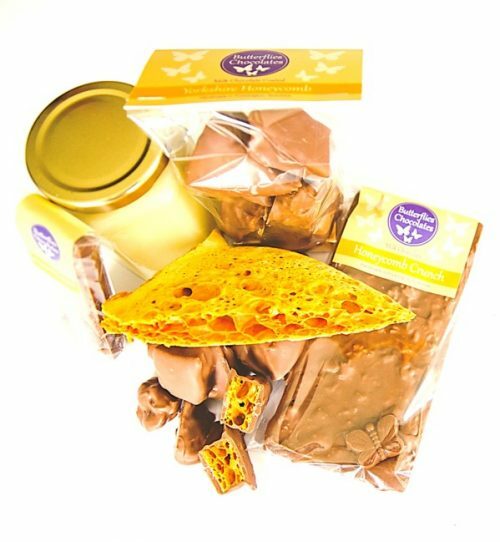 Smooth milk chocolate is blended with smashed pieces of honeycomb to provide a satisfying crunch. Also available as a collection of generous chunks or a small chocolate bar. Milk chocolate (sugar, cocoa butter, whole milk powder, cocoa mass, emulsifier: soya lecithin, natural vanilla flavouring), honeycomb (sugar, Yorkshire Honey, bicarbonate of soda).